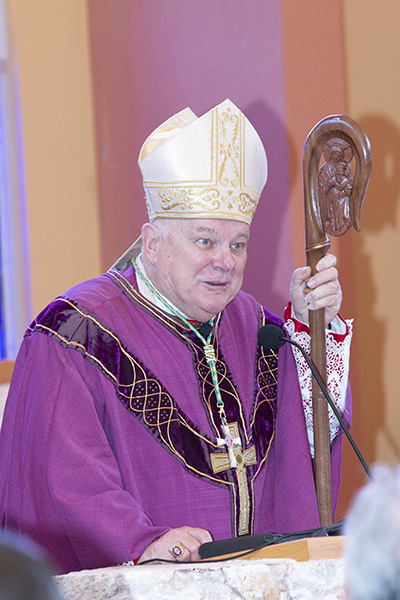 Archbishop Thomas Wenski preached this homily during a Mass at St. Thomas University, Miami Gardens, coinciding with the inauguration of David A. Armstrong as the archdiocesan university’s 10th president. 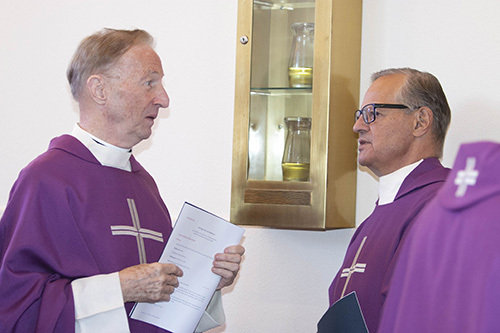 The Mass and inauguration took place March 20, 2019. Archbishop Thomas Wenski preaches the homily at the Mass prior to the Inauguration of David A. Armstrong as 10th president of St. Thomas University, Miami Gardens, March 20, 2019. Jesus had called James and his brother John the sons of thunder. Most scripture scholars say that it was because of their strong personalities. But, perhaps, today's Gospel introduces us to "thunder" in the person of their mother who asks a special favor of Jesus. James and John might not have been as strong personalities as you might think if they had to use their mother to press their cause. "What do you want?" Jesus asks the mother of James and John. And, perhaps, we too are carrying in our hearts favors that we might want to ask of Jesus. "What do you want?" This is the question that Jesus asks each one of us. But I am sure you all have heard of the saying, "Be careful of what you ask for.... because you might get it." James and John wanted to be big shots, they wanted to be important. And maybe there's nothing wrong with that. Actually, it's quite human to want to be recognized by others; And an academic degree offers us the opportunity to become leaders, to be able to make a difference in the world. Most of us – I dare say – would rather be in a position to do what we want than to do what we are told to do. St. Thomas University aspires to be “the best Catholic university in the Southeast.” We are educating students to be leaders who will succeed in life. Yes, an academic degree can help you do well – but not just as a “success robot” because you had the right connections or knew the right people. But a degree signals not entitlement but accomplishment. You can do well in your future careers, because in this university you learned that the secret of success in not found in who you know, but what you know, knowledge you acquired through hard work. In a word, this university’s mission, as a Catholic institution of higher learning, is to prepare students for life – both this life and the life to come. For this reason, we hope that the learning experience here will equip the students to do well; but also, to do good – and not just look good. I think these words are a great endorsement for St. Thomas University. Our alumni have distinguished themselves, and they have done it through the work ethic they learned here: among them are judges, mayors, entrepreneurs, priests and even a bishop – one of our graduates who went to become a Jesuit priest is a vice-president of Boston College, which many might consider an “elite” institution. Our alumni have done well – they have achieved “success” without becoming “success robots” – and most importantly they’ve done “good” – and they do good by making a difference in their communities. St. Thomas University is an amazing school. This is, really, an amazing school – and nobody has to break the law to get admitted. Past presidents of St. Thomas University, Father Patrick O'Neill, left, and Msgr. Franklyn Casale, talk before the Mass that preceded the inauguration of David A. Armstrong as 10th president of St. Thomas University, Miami Gardens, March 20, 2019. This university has many challenges. Dr. Armstrong has embraced those challenges with admirable energy and he has already shown the courage to make tough decisions. Small colleges in the United States are struggling, and St. Thomas University is a relatively small institution – we don’t have the large endowments that the so-called elite schools have and so the bottom line is not unimportant. But with the support of the board of trustees and of this community we aim to grow. We even returned to Cuba, where this institution was originally started by the Augustinian Fathers some seventy years ago. Last year we gave master’s degrees to a cohort of business students in Santiago de Cuba. We could say that Jesus came into the world to turn it upside down – or maybe more correctly right side up. Jesus doesn't go along with the world's way of understanding of power, authority, and status. For Jesus what counts is not the love of power but the power of love. He will give his apostles authority, but they are not to be authoritarian. They are to serve and not seek to be served. Jesus came to put the world right side up but first he has to turn it upside down. To walk with Jesus is to accept a new way of living in the world – the way of love, of sacrifice, of humble service. Jesus promises us glory – but not as the world understands glory. For Jesus teaches us that the road to glory passes by the way of the Cross. It's not easy to walk with Jesus turned right side up when you're used to living in an upside-down world. It’ll take practice and perseverance. This is what Jesus means when he speaks about drinking of the cup of which he will drink. Happiness is not found through self-seeking or self-assertion but through self-giving and self-sacrifice. A university that is Catholic – in its ethos and in its culture – should reflect a world view that is “right-side up,” a world view that proclaims unashamedly that God matters. We talk a lot about “Catholic identity” – what it should mean to us is simply that we identify ourselves with Jesus Christ, “the Son of Man (who) did not come to be served but to serve and give his life as a ransom for many.” Our prayers for Dr. Armstrong as he prepares to make his profession of faith and assume the leadership of this university. 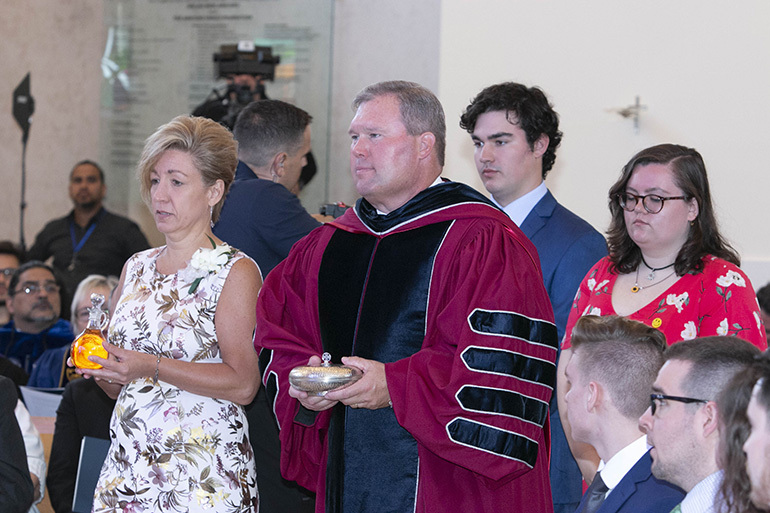 St. Thomas University's 10th president, David A. Armstrong, and his wife, Leslie, left, along with their children David, 20, and Johanna, 18, take up the offertory during the Mass that preceded Armstrong's inauguration as 10th president of St. Thomas University, Miami Gardens, March 20, 2019. Thank you Archbishop for outlining compelling reasons to chose a Catholic College. Thank you for quoting Peggy Noonan thoughts on the values of small colleges.